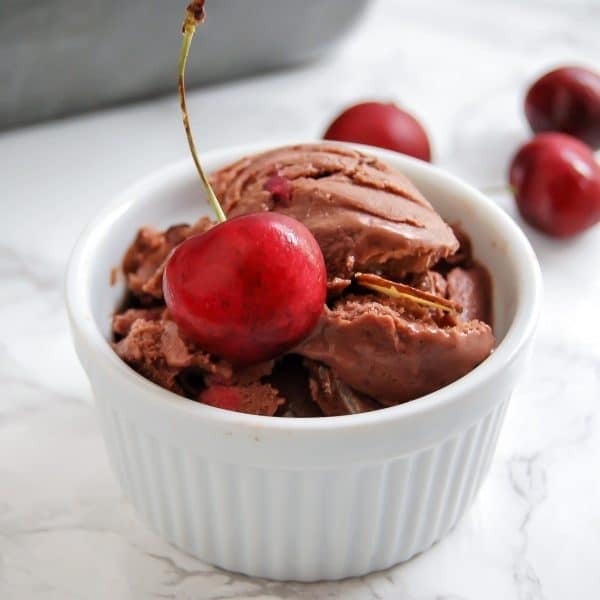 Chocolate cherry almond nice cream is a delicious antioxidant-packed summer treat with no added sugar! 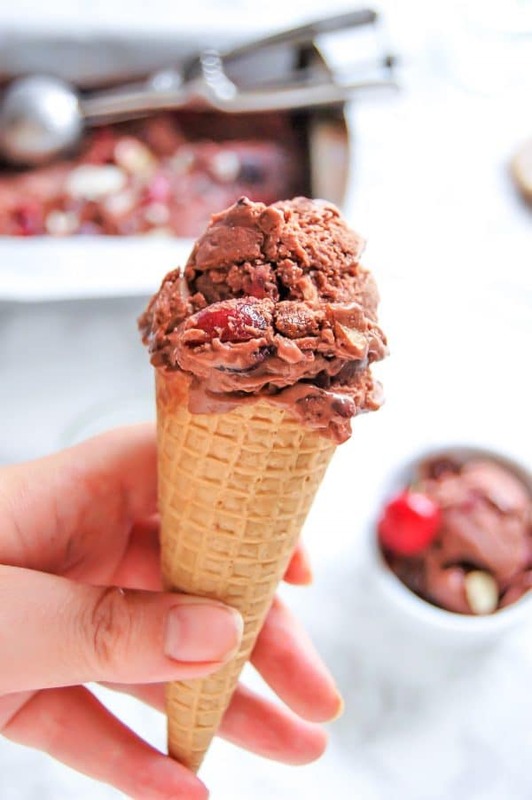 So, you’d think with a recipe for something called “nice cream” I’d be pushing a summertime detox challenge to help you get the perfect bikini body in ten days, or some other kind of baloney, right? That’s a hard no. If you want a bikini body, all you have to do is put a bikini on your body! There is no other criteria for a “bikini body”. Don’t you think if we each have our own individual sets of fingerprints, our bodies will be different, too? What I do advocate is listening to your body, which surprisingly is so much harder than you realize. With our diet culture and all the associated marketing we face (think: every time you see the word “clean food”, “detox”, “skinny food”, etc.) it’s really difficult to begin listening to our bodies. It’s hard to sift through years of mixed messages and media influence, but when you start to dismantle all food rules and truly check in with your body, it’s pretty amazing. I think one misconception I hear a lot is, “intuitive eating is dumb, I would just eat cupcakes and ice cream all day and gain so much weight.” Well, sure if you’re feeling like eating cupcakes all day, you do you. But honestly? Intuitive eating is so much more. Eating intuitively is checking in and paying attention to how different foods make your body feel. When you pay attention to the signals and cues your body is giving you surrounding an eating experience. You may realize that the taste of that cupcake starts to become cloyingly sweet after a few bites. Or maybe your body physically just doesn’t feel as nourished, energetic, or satisfied afterwards. Maybe mentally you don’t feel as focused after consuming a high-sugar food. You may feel joy and love eating the cupcake your mom made from scratch because she knows how much you’ve always loved cupcakes. You may feel happiness when surrounded by loved ones, all enjoying delicious cupcakes together. You may feel gratitude to be blessed with people who love you and make cupcakes to enjoy with you. You may feel privileged, because you never have to worry about how in the world you’re going to get food on the table to feed your family, let alone experiencing the privilege of a multitude of food choices. I hear people say sometimes that “food is fuel” and you should “eat to live, not live to eat”. But isn’t that such an overly simplistic view of food and life? When I think about eating to live, I think about sustainable, nourishing foods that will make me live my days healthy, energized, and focused. But I also think about the moments I live for, like making s’mores over the grill on a trip to the mountains with my family, my parents, and my sister and her family. I eagerly anticipate teaching my daughter things that bring me joy, like how to cook, bake, and have fun in the kitchen! With intuitive eating, it’s never black and white because there are no rules. Sometimes you choose the cupcake. Sometimes you don’t. Same with ice cream! You can enjoy whatever floats your boat – gelato, frozen custard, ice cream made with real cream and sugar, and more. You also can enjoy fruit, and fruit-based desserts like this. There are no hard and fast rules. 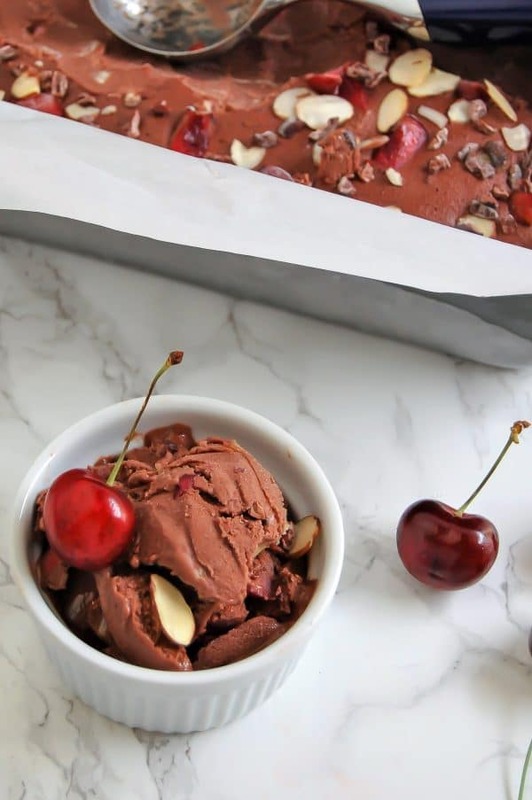 I made this Chocolate Cherry Almond Nice Cream for a few reasons. It’s way easier than making regular ice cream (no ice cream maker required!). I love treats and sweets, but don’t love how I feel if I eat too much sugar all the time. 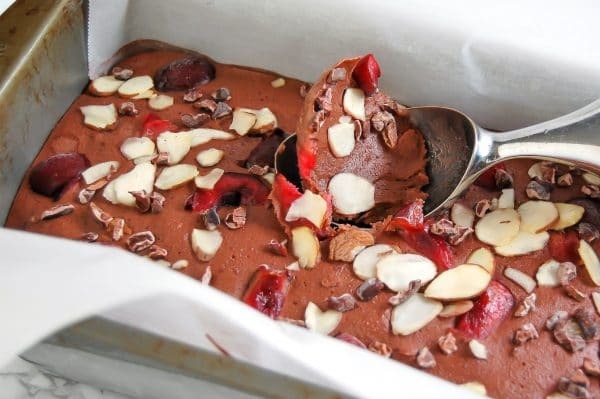 This Chocolate Cherry Almond Nice Cream, while containing zero added sugars, is still plenty sweet when you’re craving a lighter sweet treat. Since it’s just fruit and nut-based, I was able to share a few tastes with my baby! She just turned seven months old and I have no desire to give her real sugar yet, but pureed fruit, cocoa powder, and nut butter is fine. And what a precious moment that was…she was giggling and having so much fun, and it was definitely one of my kind of “eat to live” moments. 🙂 And no, she didn’t get any of the mix-ins, just the nice cream base! I also paired this dessert with real sugar! We had some one night in gluten-free sugar cones my husband found (on buy one, get one free sale, none the less!). We also made ice cream sandwiches with the freaking awesome Sweet Loren’s Gluten Free Chocolate Chunk Cookie Dough. The company sent me some coupons to try the cookie dough (they’re now available at Publix! 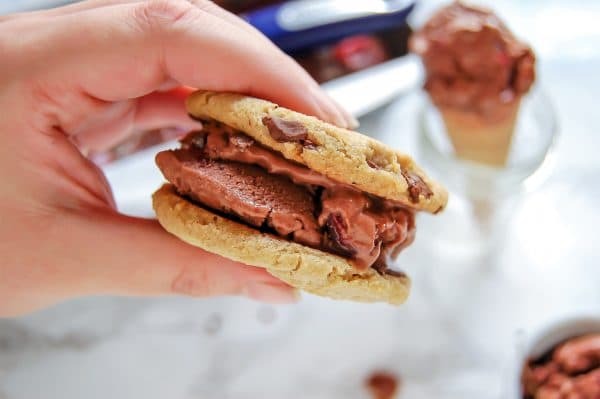 ), and I’m so glad – I mean, how perfect an ice cream sandwich do these cookies make?! Peel and slice bananas. Freeze slices overnight. 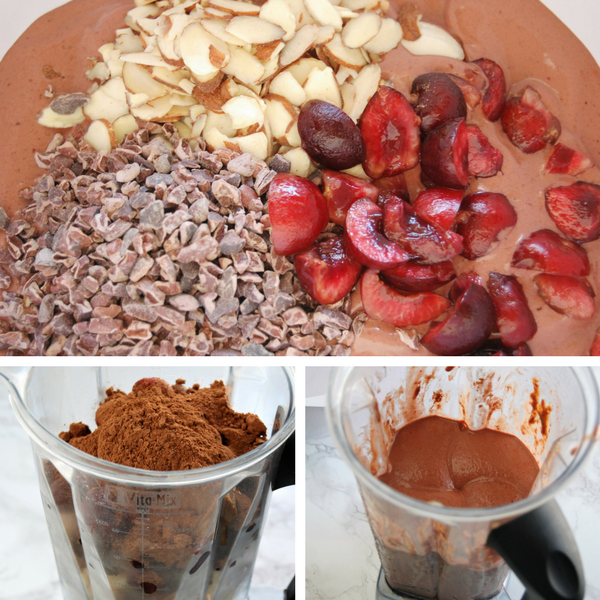 In a high powered blender or food processor, combine frozen banana slices, frozen cherries, cocoa powder, almond butter, and almond milk. Blend for 2-3 minutes, or until mixture is evenly combined and smooth. Pour the nice cream mixture into a mixing bowl. Stir in cacao nibs, almond slivers, and chopped cherries. Pour nice cream into a loaf pan and cover with foil or saran wrap. If you have a food storage container larger enough, pour nice cream into there and close lid. Freeze at least six hours or overnight. Set nice cream on the counter 10-15 minutes before serving to soften for easier scooping. Store any leftovers in an airtight container for 2-3 weeks. Yes to this whole post! A. This looks amazing and I may just have to try some tonight. And B. Intuitive eating is such an easy concept but so difficult to truly do. You did a great job explaining it in this post, something I will refer back to often! Thank you so much, Kelsey, that really means a lot! I spent a while trying to articulate some of my thoughts surrounding intuitive eating in this post. It’s something that should be so innate, but has becoming increasingly complex in our culture to the point that it just sounds ludicrous to many.